Chick-Fil-A is partnering with VeggieTales for it's upcoming Kids Meal. 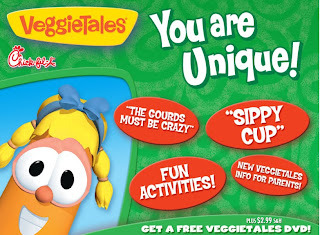 From March 13 to April 17, Chick-Fil-A Kids Meals will feature a VeggieTales CD. A new CD will be available each week. Children who receive the same CD twice can exchange the duplicate for another CD during the five-week promotion. After the promotion, parents can order CDs online as long as supplies last.